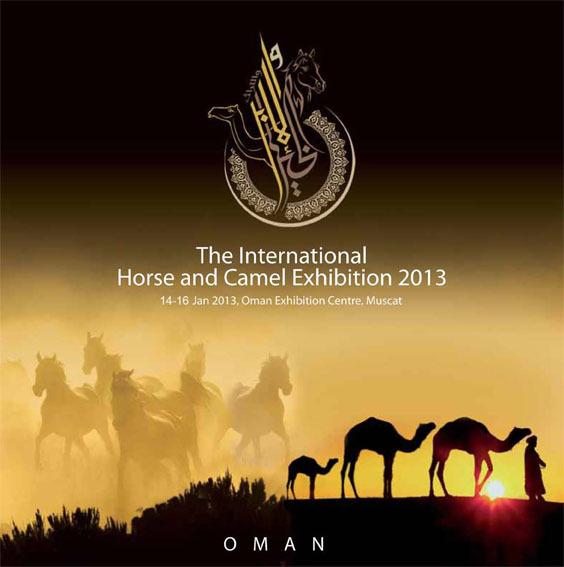 The Sultanate of Oman is preparing for the second edition of their annual Horse & Camel and Heritge Exposition January 14-16, 2013 to be held at the Oman International Exhibition Center in Muscat. The 2013 HCH Expo will feature beauty shows for horses and camels, exotic camel dance shows, costumed dancing horses, and an extravaganza of riders. Oman has a very open and stable market and the wholehearted support and participation of the Royal Cavalry. The main goal of this exhibition is to collect the largest possible number of those interested in horses, equestrian and camel under one roof from all over the world, to cooperate in all areas of business and professional, economic and knowledge also to inform and update those who interested in the latest methods of horses, camels and jockeys care and veterinary industry. As horses and Camels are a noble creatures The 2nd International Horse, Camel and Heritage exhibition the only one of a kind in Muscat to brings together all horses, camels and equestrian lovers and all the passion to offer a chance encounter with the most important makers and suppliers of accessories in the world of camels, horse riding and equestrian. Oman International Exhibition Centre SAOC was chosen because is the only organization owned by the state that are equipped to trade shows in the Sultanate of Oman (12) thousand square meters.